Few weeks back a happy parcel (indeed) came with fanciful balloons tied with colour ribbons. 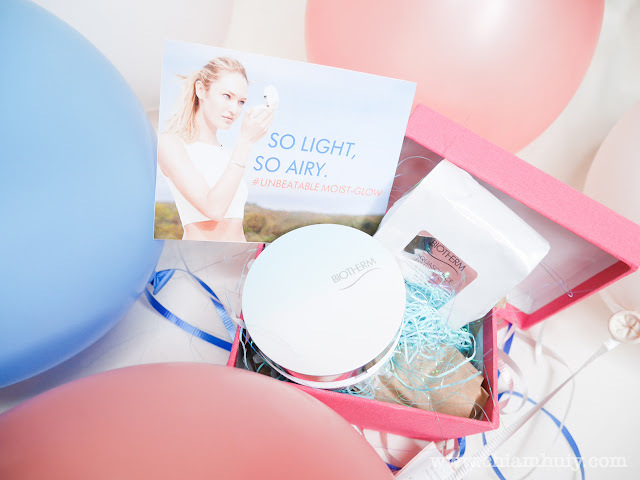 The balloons hints to us that the product inside this parcel is as light and airy as how balloons can be, and it's none other than... Biotherm first ever Aquasource Evermoist CC Cushion! The C.C. Cushion applies on to give your skin a natural, fresh finish while providing intense hydration. When I apply this on, it does feel really lightweight and to my surprise, fresh and hydrating! I thought this is quite an achievement especially when all other bb/cc cushion to me are usually slightly heavy, it makes my skin feels very un-breathable. Good thing about this Biotherm Aquasource Evermoist CC Cushion is that it's very breathable and hydrating at the same time. The downside is, if you have really oily skin, this might cause you to feel heavier after few hours of application. For me, I have to use tissue paper to blot a little. This is pretty inevitable for oily skin. 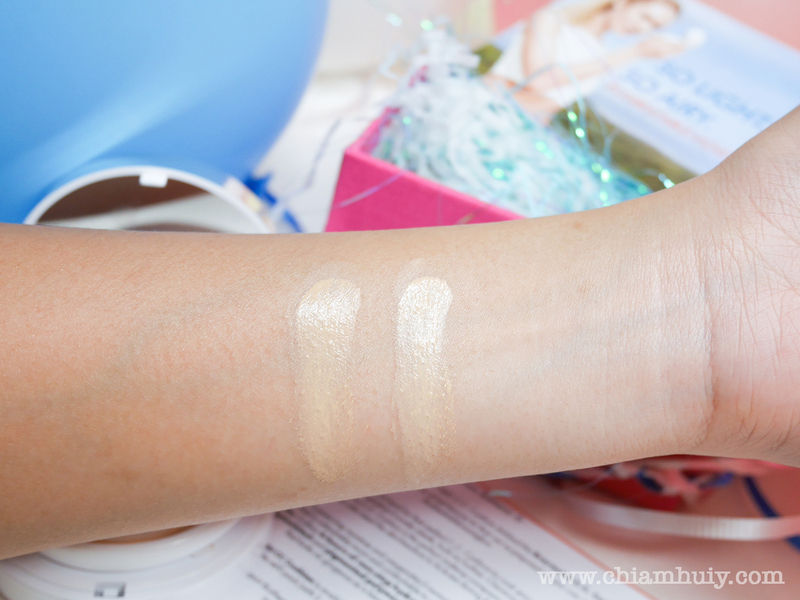 The Biotherm Evermoist CC Cushion comes in 2 shades: Natural Beige (left) and Fair Beige (right). I'm using Natural Beige cos I'm slightly tan. 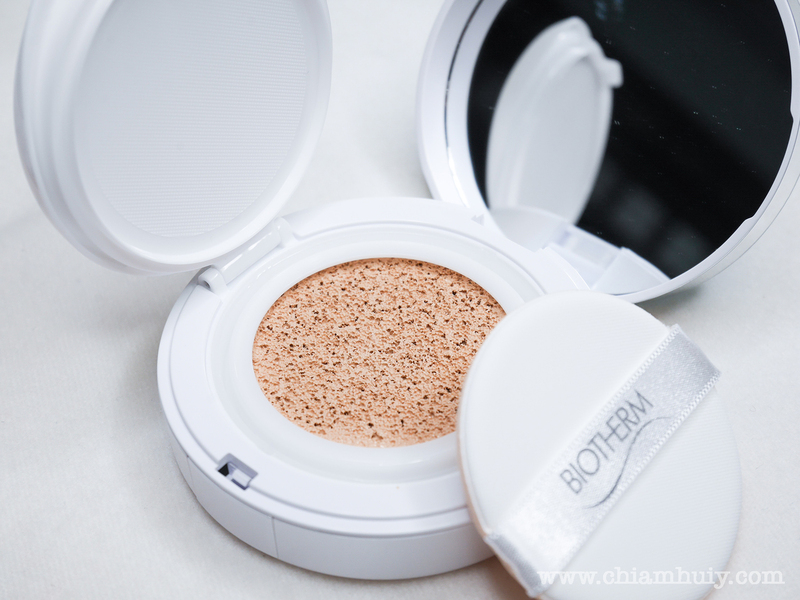 The texture of this Biotherm Aquasource Evermoist CC Cushion is very lightweight and moisturizing. One finger press down the cushion you can feel the soft and moist CC cream well soaked in the cushion sponge. Most importantly? This CC Cushion is formulated with Life Plankton™ cellular water, which offers 4-hours of non-stop hydration with youth-protecting Adenosine, brightening Symwhite® and pigmented polymer gel. We all heard wonders of the Life Plankton essence, so I'm having good thoughts about this product! Who would I recommend this product? Those who felt that makeup strips off the moisture underneath their skin. Those who felt that putting on makeup makes their skin heavy and un-breatheable. Try this Aquasource Evermoist CC Cushion for a more moisturized makeup experience! 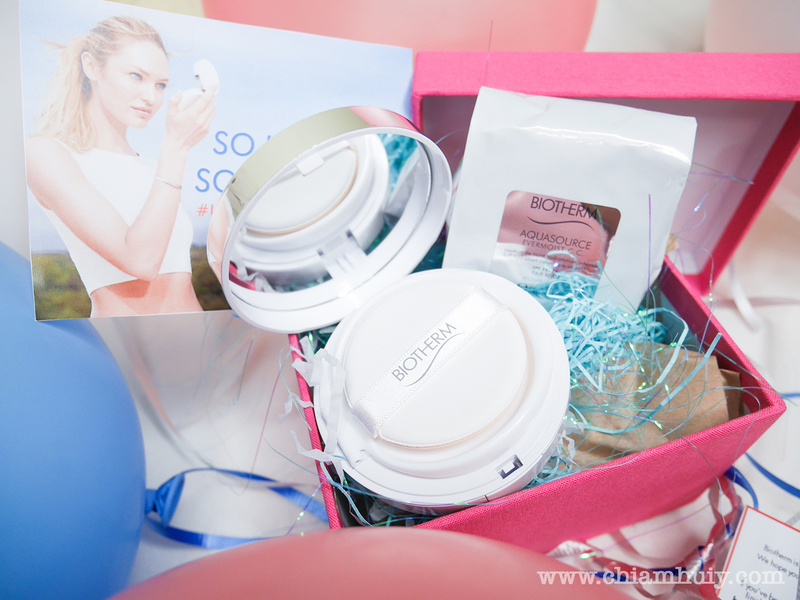 The Biotherm Aquasource Evermoist CC Cushion case retails at $17, the refill pack (with 2 refills) retails at $52. Total price (for refill pack and case) is $69.